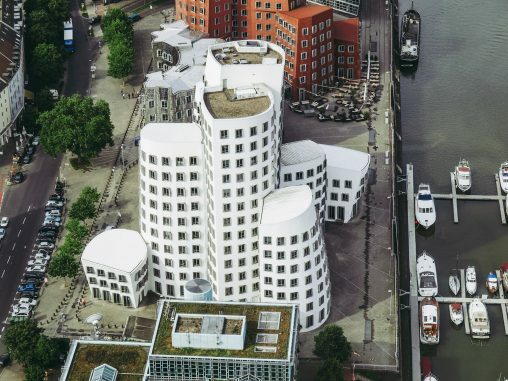 Think Gehry and you picture the iconic Guggenheim Museum in Bilbao, but of course this celebrated ‘starchitect’ who helped to define the shape of the modern era has many more famous edifices and projects to his name. 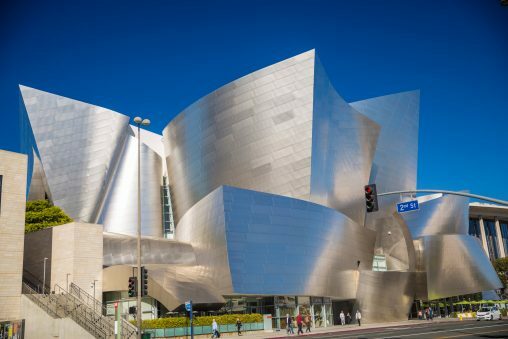 They include the Walt Disney Concert Hall in Los Angeles, the Louis Vuitton art museum and cultural centre in Paris, the Museum of Pop Culture in Seattle and the Weisman Art Museum in Minneapolis, to name a few. 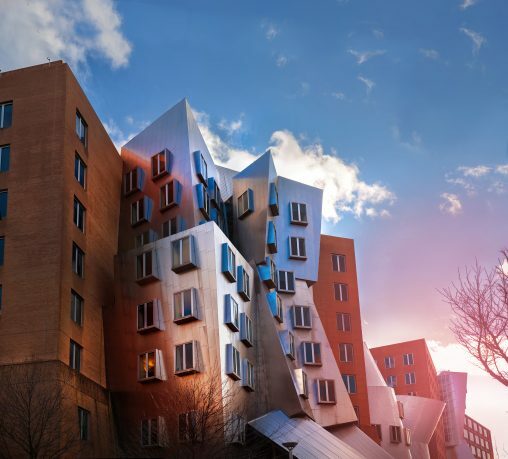 Named “the most important architect of our age” by Vanity Fair in 2010, many of Gehry’s most famous designs involve museums and other large public projects, yet he also managed to raise eyebrows and shift boundaries when creating the now-iconic academic complex – known as Building 32 – for the Massachusetts Institute of Technology (MIT). Not surprisingly, given his stature around the world and particularly in North America, Frank Gehry was also chosen to give shape to the Dwight D. Eisenhower Memorial in Washington DC. The lines and surfaces of the Walt Disney Concert Hall catch the Californian sun. Born in Toronto to a family with American links, the future architect was creative from a young age, building his own scale towns from pieces of wood when other kids were out playing ball. After graduating from the University of Southern California in LA, he added city planning to his arsenal, studying at the Harvard Graduate School of Design in Cambridge, Massachusetts. His career, however, took him straight back to Los Angeles, where he settled down working for Victor Gruen Associates, designing a villa as his first independent project. The ‘David Cabin’, which dates from 1957, already bears the unmistakable mark of Gehry design, with its unusual application of materials, wildly angular forms and exposed construction elements. The oddly shaped dorm rooms at MIT in Cambridge, Massachusetts. 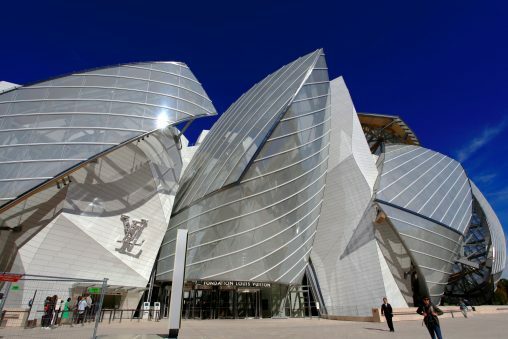 European experience was gained in Paris under architect André Remondet, before the now-famous Frank O. Gehry and Associates was established in LA in 1967, re-established in 2001 as Gehry Partners. His early autonomous projects involved mostly villas and suburban shopping malls, but it was with his own home that Gehry had the freedom to showcase his design philosophy. And showcase he did, drawing praise and criticism in equal measure with his outlandish use of unusual features such as chain-link fences and corrugated steel facias. The almost total absence of symmetry and harmony shown is often considered to be a prime example of the deconstructivist school of architecture that took root in the USA in the 1980s. 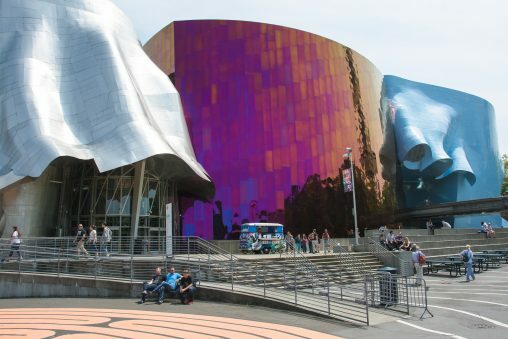 Though Gehry himself denies this, his creations are nothing if not deconstructivist in nature. The Fondation Louis Vuitton art and culture museum in Paris. Interestingly, the Santa Monica villa was never sold and remains his property, but what it did establish is the fact that this is not just another architect. In a profession where most dream of developing their own signature style – and being acclaimed for this – Gehry achieved renown with his Marmite/liquorice appeal, strongly dividing opinions between those who love and deplore his work. Among the latter were some of his neighbours, though the bold showing of design philosophy did nothing to hinder his career. By the late 1980s, Frank Gehry had the first of his major public projects under his belt, namely the Cabrillo Marine Aquarium and the Californian Museum of Science and Industry, yet his talent was only truly confirmed when he won the highly prestigious 1989 Pritzker Architecture Prize, which is to his field what the Oscars are to the entertainment industry. 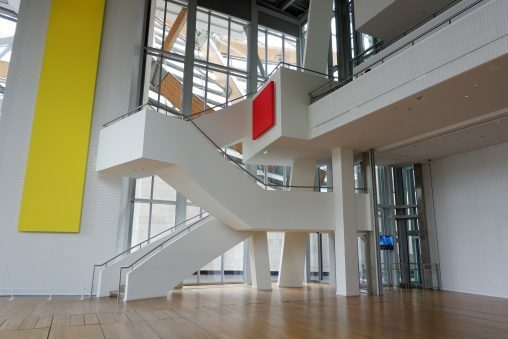 In the new Medienhafen, Düsseldorf, Frank Gehry has been able to apply his vision to a number of neighbouring structures. A ‘starchitect’ in the making, Gehry now ranked among the greats of his day, and it was his free-spirited openness to experimentation that was appreciated. 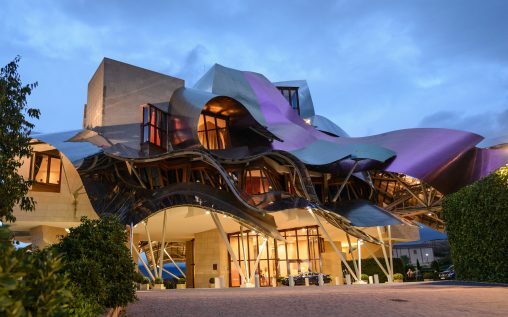 Love or hate his work, it cannot be denied that Frank Gehry never let critical or commercial success temper his creativity and seduce him to ‘play it safe’. Indeed, rather than create buildings that ‘design themselves’ according to logical principles of space, light, layout and proportion, he sought out the complicated, de- and reconstructing the art of building design in much the way Heston Blumenthal turns gastronomy into an alchemic science. His work, with its seemingly random jagged edges jutting out at equally random angles has been described as ‘a collage of juxtaposed spaces and materials’ that challenge the eye to redefine its concept of what a building should look like. His oeuvre expanded significantly during the 1990s, but the defining moment came in 1997, with the opening of the Guggenheim Museum in Bilbao. 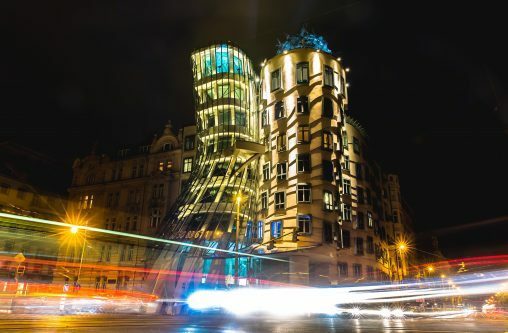 Prague’s very own Dancing House features the iconic ‘gravity defying’ architecture of Frank Gehry. 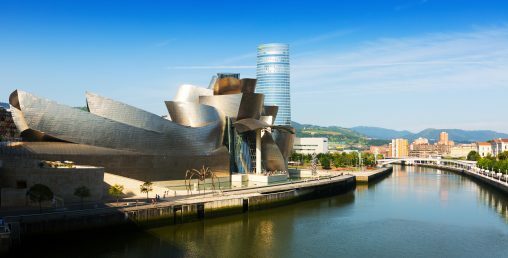 Both architect and city were instantly famous, with Gehry gaining his internationally acclaimed masterpiece and Bilbao a globally recognised iconic identity in a landmark that has indeed become its modern symbol. In fact, you could say that the museum is the embodiment of Bilbao’s post-industrial resurrection, but even apart from such considerations the otherworldly limestone building clad in glass and titanium almost defies description. Like a medieval fairy tale castle imagined by those not familiar with rulers and protractors, it also seems to defy the very law of physics, and it is a ode to modern construction materials and technologies – of which Gehry has always been a leading champion – that the parts do indeed fit and remain together. Much of the same inspiration had gone into the El Peix sculpture set at the entrance to the Port Olimpic in Barcelona, at the time of the 1992 Olympic Games. A very new appearance in La Rioja’s wine country. Though Gehry does not claim any allegiance to the Deconstructivist School, his most iconic designs – like the Guggenheim Museum – are 32,500 square metres of shining, shimmering, metallic irregularity that not only dances before one’s pupils but has also come to challenge the established rules of architecture and redefined its modern interpretation. More prestigious projects around the world would follow in the wake of this great success, but gradually the period of raggedly styled museums, cultural centres and concert halls was joined by a new range of projects that includes university campuses, parks and high-rise office and apartment towers. 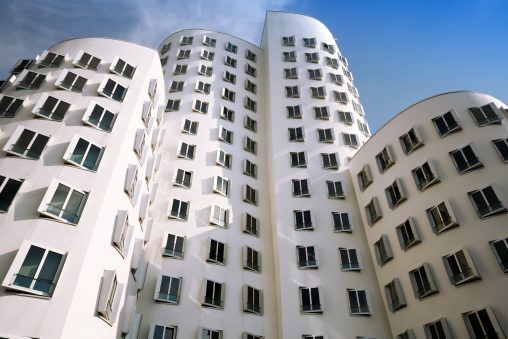 Within a few years of his Basque triumph, Gehry had moderated his style to produce more harmonious, balanced and understated edifices such as the New World Center in Miami Beach, the Stata Center (Building 32) at MIT, the IAC Building and the 76-story 8 Spruce Street, both in New York City. Interior spaces of the Luis Vuitton foundation. Today, he is working on large city-based infrastructural projects such as the Grand Avenue Project and the Los Angeles River Revitalization Corporation, drawing on both his training in town planning and his love for his adopted city. This new period may be a little less fantastical than his earlier ones – though he still reserves the right to be completely outrageous when designing public spaces – but as the 89-year old master architect’s career winds down it is clear that perhaps his greatest legacy of all will be the way he challenged and changed modern architecture as we know it. A whole new generation of architects will follow in his footsteps, and many have indeed already stepped through the door of possibilities opened by perhaps the most influential designer of the past 60 years. Originally published in Essential Marbella magazine. A touch of retro inspiration is visible in this Gehry design. The weird and colourful EMP building in Seattle. This entry was posted on Monday, March 25th, 2019 at 5:55 pm	and is filed under Design. You can follow any responses to this entry through the RSS 2.0 feed. You can leave a response, or trackback from your own site. Please note that your comment might not appear inmediately if for some reason it triggers our anti-spam filter. In such case it will soon be reviewed and accepted accordingly.